Want some super ‘delicioso’ fun? And meet Dora? 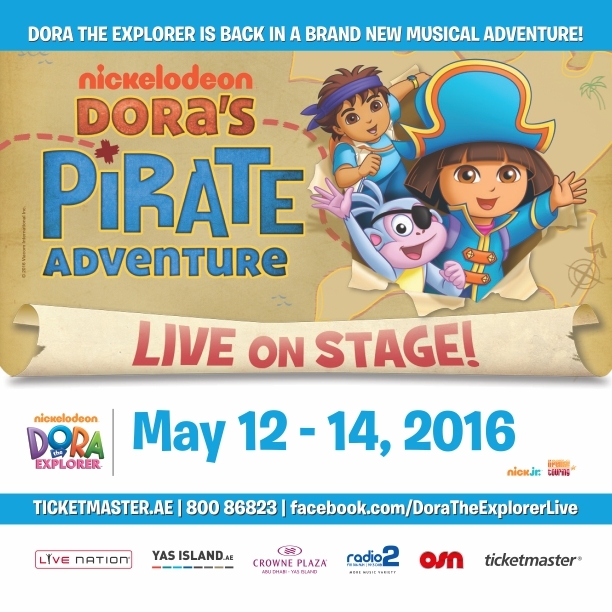 Kids will love the Dora The Explorer show and the opportunity to Meet & Greet opportunities with Dora after her show, Dora’s Pirate Adventure live at du Forum, Yas Island! For an additional AED 50 on ticket price (every category but Royal), guests can add and upgrade their tickets to include a Meet & Greet with their favourite Dora characters and take pictures with her after the show. But watch out, there are only 50 slots per show, so make sure to hurry and get those tickets via www.ticketmaster.ae before they get swiped by Swiper! All ticket holders who have already purchased tickets will get a special link sent from Ticketmaster to allow them to upgrade with a Meet & Greet pass. Alternatively, they can call Ticketmaster on 800 TMUAE (800 86823) or on the international number +971 4 366 2289. Clever mini explorers will make sure to grab Royal Passes which automatically include the Meet & Greet with Dora and also a special Dora Goodie Bag complete with Dora DVD, perfect for planning their own adventures! All ticketholders can also make it a day out to remember with a trip to Yas Waterworld, and enjoy entry for only AED 75 when presenting their Dora Pirate Adventure ticket up until May 29th! Yas Waterworld Abu Dhabi, the only Emirati-themed waterpark in the world, is inspired by the UAE’s rich heritage of pearl diving through its unique story of ‘The Legend of the Lost Pearl’. The UAE’s first mega waterpark is home to 45 exhilarating rides, slides and attractions – five of which can be found nowhere else in the world. With rides and experiences on offer to thrill both the young and the young at heart, the waterpark plays host to Dawwama – the world’s first hydro-magnetic tornado waterslide, as well as the globe’s first interactive water and laser rollercoaster, Bandit Bomber. Dora’s Pirate Adventure incorporates the interactive and educational elements that make Dora the Explorer one of the most popular shows on television. Live shows allow Nickelodeon to bring experiential entertainment to the stage for kids and families. Join Dora and her friends as they embark on an exciting trip to Treasure Island in search of the ultimate pirate party. Help them navigate over the Dancing Mountain and through the Silly Singing Bridge in pursuit of the Pirate Kitties. Along the way, Dora the Explorer fans will use their map-reading, counting, musical and language skills to successfully help Dora reach Treasure Island and avoid that pesky fox, Swiper! For ticket inquiries, visit www.ticketmaster.ae or call 800 86823. Dubai our Sandbox brings you the chance to WIN 2 GOLD TICKETS to see the award-winning show. The winner will be announced on Thursday April 28th via Facebook.